The Urban Horticulture Program provides integrated landscape management information and education to the professional landscape industry. Continuing our collaboration with the Marin Municipal Water District, more than 50 Master Gardener volunteers provided consultations to more than 290 property owners. Consultations included helping property owners reduce the amount of water used in landscapes by assisting them with garden and irrigation design, identification of maintenance issues, and plant selection. 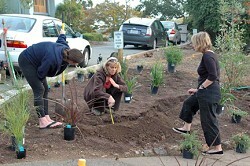 Known as the Bay-Friendly Garden Walks, this program won the Marin Conservation League’s 2009 Ted Wellman Water Award for water resource management. We have initiated the Marin Gardens Project, through support from the Marin Community Foundation. In the first year, we are networking with community garden partners to complete a countywide community gardens needs assessment, as well as strengthen delivery of technical support to Marin’s community and school gardens. 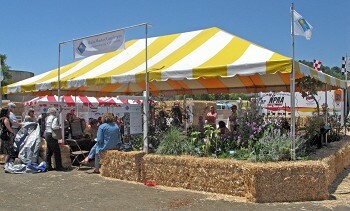 More than 1,500 visitors attended 15 presentations or toured victory garden demonstrations at the Marin County Fair. Approximately 80 Master Gardeners staffed the demonstration gardens and delivered these presentations over five days. 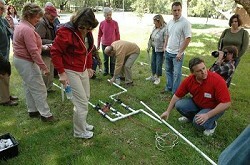 Visitors and participants learned how to grow vegetables and increase backyard sustainability. The Western Fair Association awarded the booth first place for “Community Outreach” in 2009. "Thank you so much for spending the time to teach me about my water system and giving me helpful advice about my garden. Keep up the great work and I am sure you will continue to make a big difference!"